This is an Elder Dragon Highlander (EDH) deck that builds around the theme of the Exalted gameplay dynamic which was introduced to the Alara Block (Shards of Alara, Conflux, and Alara Unleashed). I didn't think much of the Exalted ability at first, but I got more interested when you had more cards on the battlefield with the Exalted ability. This is because the Exalted ability continues to stack. You can attack with a creature with Exalted if you want; but, I can use the stacking benefits of Exalted for other creatures on the battlefield. The deck took me a couple of months to playtest, it was due to getting the necessary mana fixing and support cards. There was also the fact of getting two planeswalkers into the deck as well. While this is built around the theme of Exalted, the sole emphasis is not on that ability. I have a good number of non-Exalted cards because these cards will build off each other. However, there is the risk because you only get the benefits if you only attack with one creature, but that's not necessarily a problem as long as you have the right cards in play. Also the cards show that you don't need specific cards to get the job done. Official artwork for Jenara, Asura of War. Since I was building on the theme of Bant, I had to pick a general that allowed me to use Green, White, and Blue. I origially was going to use Rafiq of the Many, but I had to anticipate the possibility that other people would be using that card as well. Ultimately, I went with using Jenara, Asura of War. This was due to the card costing one mana less than Rafiq of the Many. When your general goes into the graveyard, it costs two mana extra to bring the general back onto the battlefield again. 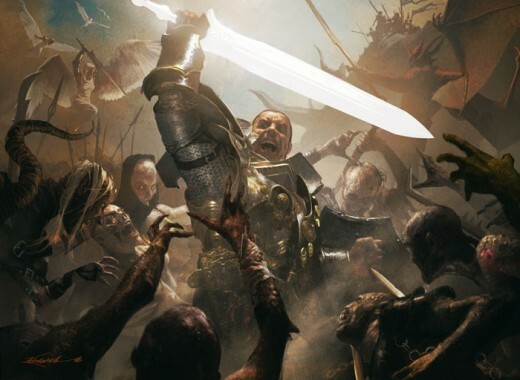 While all players start with 40 points of life, one of the ways a player can lose the game is if s/he sustains twenty points of damage from a specific general. 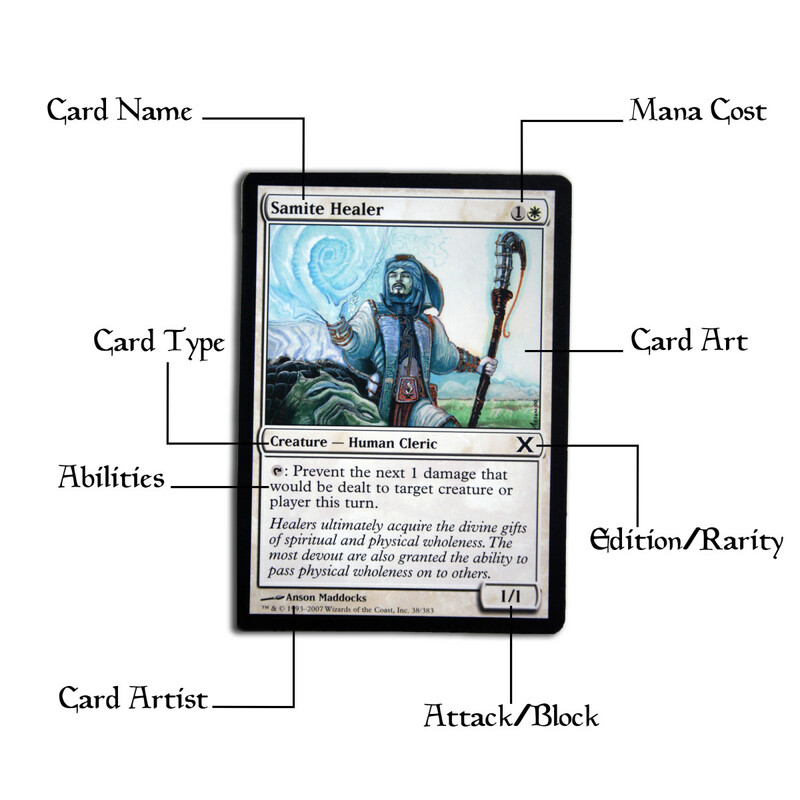 With this EDH deck, the main focus is on speed and getting the job done. For that reason, that one mana cost difference is very important. You have to think about the possibility of opponents playing spells and abilities that really messes up your mana flow. Such examples would be playing a spell that destroys all lands and/or artifacts. That sole factor influenced me to pick Jenara, Asura of War over Rafiq of the Many. The mana cost is 1 Green, 1 White, & 1 Blue. This is a 3/3 creature with Flying. I can use Jenara, Asura of War to attack opponents who aren't able to block Flying creatures. But that's not the only useful ability. I can activate its main ability by paying 1 White & 1 Colorless. Doing so allows me to add a +1/+1 counter to Jenara, Asura of War. As long as I have enough mana, I can keep pumping up Jenara, Asura of War to beef up offense and defense. With certain cards, I can accelerate the number of counters I place on the card. Jenara, Asura of War turned out to be a great EDH general when you have the right cards on the battlefield. Even though Jenara, Asura of War does not have the Exalted ability, you can make good use when combined with Exalted cards like Rafiq of the Many. Official artwork for Rafiq of the Many. Official artwork for Noble Hierarch. Official art for Master of the Wild Hunt. 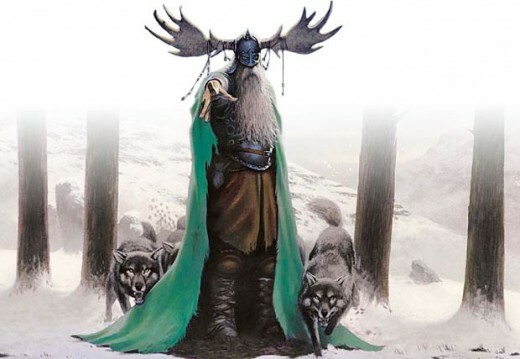 Official artwork for Great Sable Stag. Official artwork for Baneslayer Angel. It's not really an Exalted deck without creatures. So far, I have a combination of Green, White, and Blue creatures to keep to the theme of Exalted. You want to have as many Exalted cards as possible in your deck. Even if you have a couple of Exalted cards on the battlefield, that's enough to get you through a couple of turns before you get other cards out. Sovereigns of Lost Alara – 1 White, 1 Blue, & 4 Colorless; This is a 4/4 creature with Exalted. I used this card mainly for the 4/4 and the Exalted. I don't have enough Aura Enchantments to take advantage of the creature's main ability. Rafiq of the Many – 1 Green, 1 White, 1 Blue, & 1 Colorless; This is a very important card to have in any Bant-colored deck. But, it's mainly effective with other Exalted cards. As long as this card's on the battlefield, any creature I use to attack alone gets Double Strike until the end of the turn. A 1/1 creature can deal up to 4 points of damage; it's +1/+1 with the Exalted ability by attacking alone and the extra 2 points of damage from Double Strike. Guiltspire Avenger – 1 Green, 1 White, & 1 Blue; I chose this for the Exalted. Knotvine Paladin – 1 Green & 1 White; I chose this card for the offensive capabilities. While this card doesn't have Exalted, its ability becomes overkill with Exalted. Stoic Angel – 1 Green, 1 White, 1 Blue, & 1 Colorless; I found the Flying and Vigilance abilities attractive. However, the main ability is quite useful for this deck. Knight of New Alara – 1 Green, 1 White, & 2 Colorless; Since this is a multicolored deck, I found this card's ability to be valuable for this deck. It encourages me to attack with my multicolored creatures more. Jhessian Infiltrator – 1 Green & 1 Blue; The Unblockable ability is insane combined with Knight of New Alara and a couple Exalted cards on the battlefield. Empyrial Archangel – 1 Green, 2 White, 1 Blue, & 4 Colorless; Flying & Shroud are valuable along with the fact that it's 5/8. It's main ability is valuable provided that it's pumped up. However, you can use any direct pump-up ability on this creature due to this Shroud. Wall of Denial – 1 White, 1 Blue, & 1 Colorless; An 0/8 with Flying and Shroud is valuable. Indirect methods to pump up the creature go quite well. Rhox Charger – 1 Green & 3 Colorless; Trample & Exalted. Noble Hierarch – 1 Green; One of the green Exalted cards; Its main ability is good for mana fixing. Wolfbriar Elemental – 2 Green & 2 Colorless; Its Multikicker ability is quite valuable to this deck. 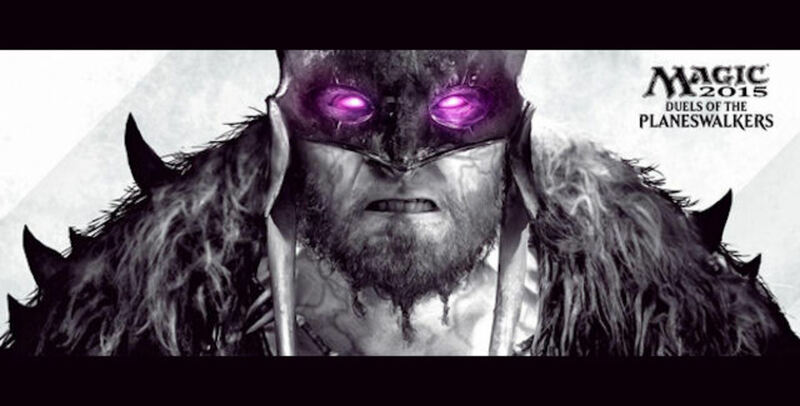 Master the Wild Hunt – 2 Green & 2 Colorless; Its two abilities are quite useful. Combined with Wolfbriar Elemental, you can unleash an army of 2/2 green wolf tokens. Ant Queen – 2 Green & 3 Colorless; Its main ability allows you to spawn green Insect tokens. Protean Hydra – 1 Green & X Colorless; Its abilities are very useful to this deck. Combined with Exalted, Protean Hydra becomes a juggernaut. Great Sable Stag – 2 Green & 1 Colorless; Its first ability is quite useful. The main ability is very useful against Blue and Black users. Combined with Exalted, Great Sable Stag is a force to be reckoned with. Scute Mob – 1 Green; Its main ability is useful provided it gets put onto the battlefield early enough. Birds of Paradise – 1 Green; Mana fixing. Utopia Tree – 1 Green; Mana fixing. 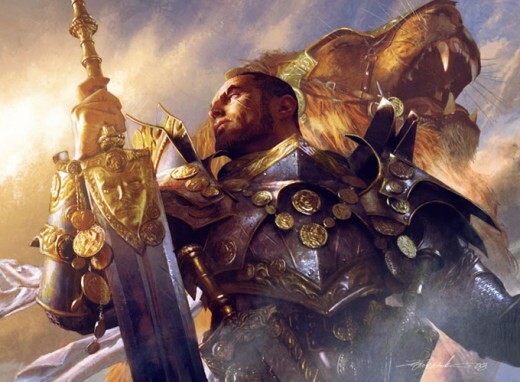 Sigiled Paladin – 2 White; First Strike & Exalted. 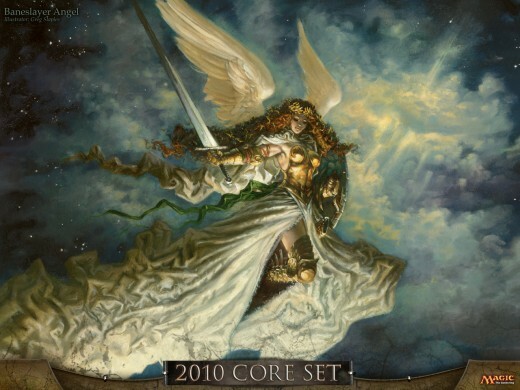 Battlegrace Angel – 2 White & 3 Colorless; Flying & Exalted. Its main ability gives Lifelink to any creature of yours that attacks alone. Celestial Crusader – 2 White & 2 Colorless; Flash, Split Second, & Flying. Its main ability gives other White creatures +1/+1. Serra Avatar – 3 White & 4 Colorless; Very useful card. If you have cards that give your creatures Lifelink and other ways to gain life points, Serra Avatar is a beast. 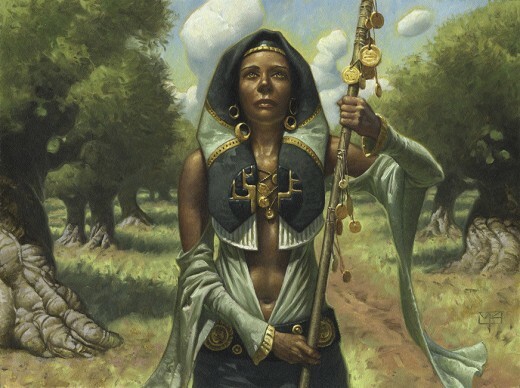 Only way to truly get rid of Serra Avatar is to Exile it. Emeria Angel – 2 White & 2 Colorless; Its main ability is valuable to the deck. 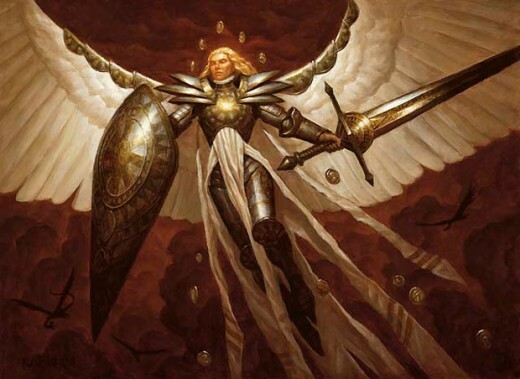 Baneslayer Angel – 2 White & 3 Colorless; Its abilities are valuable to the deck. It has Flying, First Strike, Lifelink, Protection from Dragons, and Protection from Demons. Combined with Rafiq of the Many, Baneslayer Angel is quite useful. Lightwielder Paladin – 2 White & 3 Colorless; A very good anti-Black & anti-Red card. Mirror-Sigil Sergeant – 1 White & 5 Colorless; A good way to raise an army of juggernauts. Dawnray Archer – 1 Blue & 2 Colorless; Exalted. Inkwell Leviathan – 2 Blue & 7 Colorless; Its abilities are quite useful. Plus, you have a juggernaut that cannot be targeted. Phantom Warrior – 2 Blue & 1 Colorless; Its Unblockable. Combined with Exalted, the Phantom Warrior is a formidable creature. Sphinx of Magosi – 3 Blue & 3 Colorless; Its main ability is quite valuable. You can pump it up while being able to draw cards. Darksteel Colossus – 11 Colorless; It has Trample and Indestructibility. Only way to really get rid of this creature is to Exile it. Platinum Angel – 4 Colorless; A good target. You will need a combination of basic and nonbasic lands. Nimbus Maze; It's abilities are quite useful. 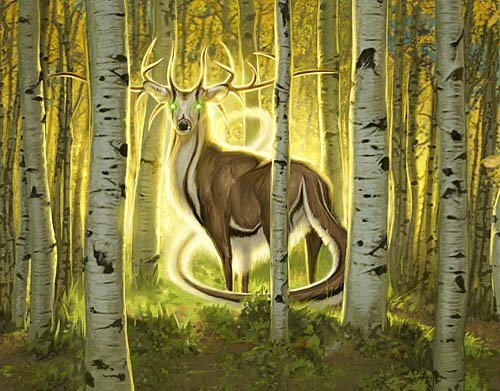 Oran Rief, the Vastwood; Its ability is good if you have Green creatures. Official artwork for Finest Hour. Enchantments are very important to this deck. As you can see, I have placed a good number of enchantment cards into this deck. Most of these cards, when on the battlefield, will pump up your creatures. Finest Hour – 1 Green, 1 White, & 1 Blue; It has Exalted. The main ability gives you a second combat phase. If you have Rafiq of the Many on the battlefield at the same time as Finest Hour, you can deal much damage to an opponent. With Jenara, Asura of War, you can definitely win via general damage. Luminarch Ascension – 1 White & 1 Colorless; It's a good way to raise an army of 4/4 angel tokens. Make sure you have methods to prevent yourself from taking damage. Crusade – 2 White; All white creatures have +1/+1. Honor of the Pure – 1 White & 1 Colorless; Your White creatures get +1/+1. Cradle of Vitality – 1 White & 3 Colorless; Every time you gain life, you can pay 1 White & 1 Colorless to put that many +1/+1 counters on a target creature. I can put those counters on the Protean Hydra. True Conviction – 3 White & 3 Colorless; All your creatures get Double Strike and Lifelink. Marshall's Anthem – 2 White & 2 Colorless; Its abilities are useful. 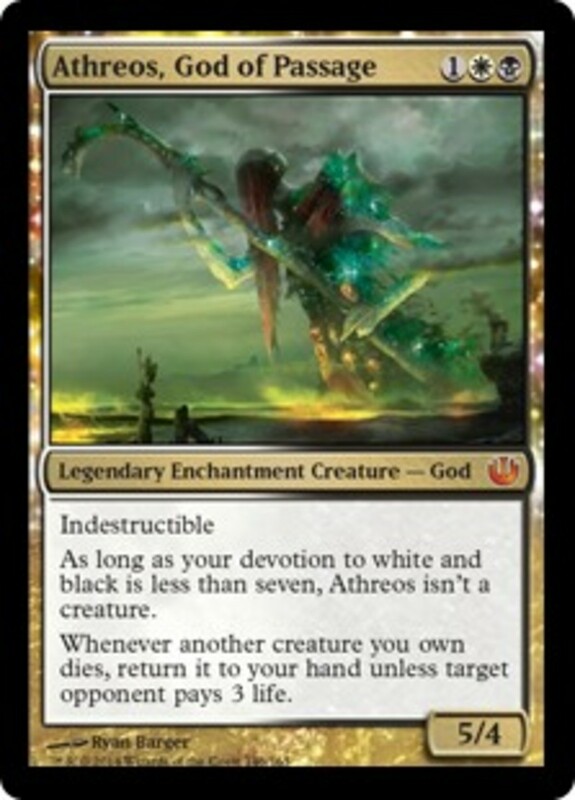 Glorious Anthem – 2 White & 1 Colorless; Creatures you control get +1/+1. Indestructibility – 1 White & 3 Colorless; Enchanted permanent is Indestructible. Aspect of Mongoose – 1 Green & 1 Colorless; Enchanted creature gets Shroud. Only way to get rid of that enchantment is by Exile. Mana Reflection – 2 Green & 4 Colorless; Mana acceleration. Levitation – 2 Blue & 2 Colorless; All your creatures have the Flying ability. Artifacts are very important as they helped with the mana fixing. When using a multicolored deck, mana fixing is very crucial to the deck. Whispersilk Cloak – 3 Colorless; Gives Shroud to target creature. Also, the creature is Unblockable. Wildfield Borderpost – 1 Green, 1 White, & 1 Colorless. Fieldmist Borderpost – 1 White, 1 Blue, & 1 Colorless. Everflowing Chalice – 0 Mana; Multikicker ability is valuable. Having a couple of planeswalkers will help. 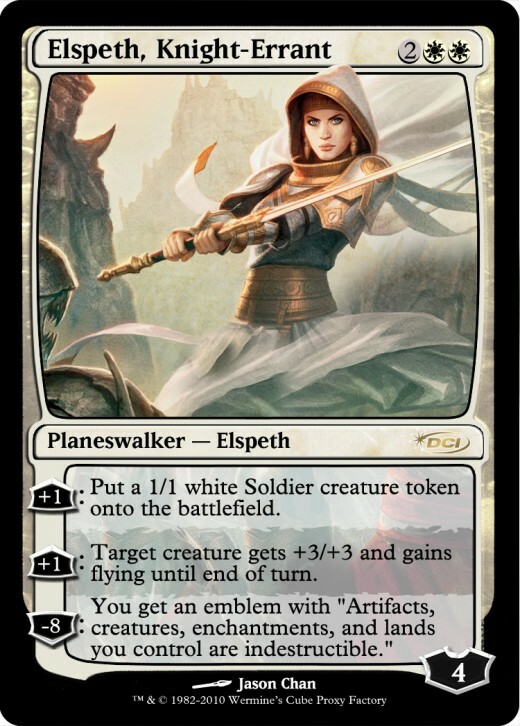 Elspeth, Knight-Errant – 2 White & 2 Colorless; Very useful card. This is a purely offensive deck. In order to get the most out of this deck is to constantly attack; but, you attack only with one creature to get the benefits. When one creature gets sent to the graveyard, you still have an army of creatures left. Then, you attack with another creature. When you bring out the juggernauts, use one of them to attack. That way, you keep the heat on your opponents. It's very important to ensure that you have formidable defenses as well.